A weekly newspaper’s 5,000-strong petition opposing a rail project which would “destroy” a town centre on its patch has been handed over to Boris Johnson’s number two. 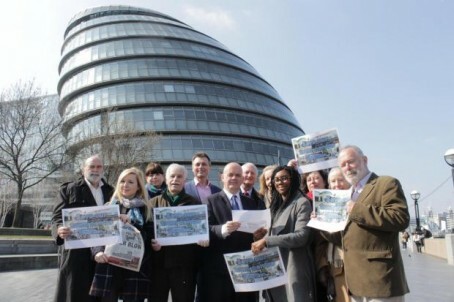 Roger Evans, the deputy Mayor of London, received the petition from the Wimbledon Guardian, which aims to highlight opposition to Crossrail 2, a proposed new rail link between North and South London. Current plans by Transport for London for the route include a revamp of Wimbledon railway station, which would mean the demolition of large parts of Wimbledon town centre. It is estimated between 3,000 and 5,000 jobs would be lost or displaced as a result, with 60pc of a local shopping centre demolished along with buildings including a pub, care home and church. The multi-million pound plans would mean up to ten years of disruption for residents and businesses, and some could be set to lose their homes. The petition was presented at City Hall by news editor Becky Middleton and reporter Pippa Allen-Kinross, who both organised the campaign. Said Becky: “I am delighted more than 5,000 people from around the world have supported the Wimbledon Guardian’s petition to save the town centre from Crossrail 2. “On receiving the petition at City Hall on Thursday, the deputy mayor of London Roger Evans said it was one of the biggest petitions he had ever seen. Get a life. Other regions and towns would bite their hands off to have such a good transport link. Middle class NIMBYS. The very last image I want on my mind so soon after lunch is “Boris Johnson’s number two”, thank you very much.